The much anticipated finals took place, on the 4th of June at the University of Cape Town, were big Gauteng rival teams came face to face; to decide who the 2008 USSA/SASSU champions will be. Teams were well prepared and mental games were scheduled. 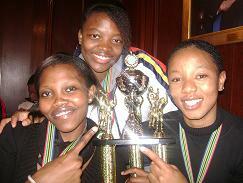 The first final was the University of Johannesburg vs. The University of Pretoria (ladies), after meeting each other during the group stages and UJ losing to TUKS. UJ were very determined in winning the championship, but TUKS was not going to let that happen. The game was close from the jump ball and it was the team which was mentally stronger, that was to win the championship. 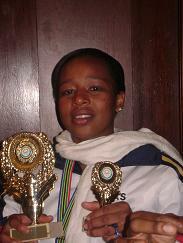 Requelh Molema was the dominating player of the game, on both ends of the court. The 3 point line was like shooting free throws for the young lady from Sheshigo (Limpopo). Requelh averaged more than 20 points and was 3 for 4 from the line. From shot blocks to steals, UJ had trouble breaking the sold defence TUKS was playing. Makghotso Moloantoa had an exceptional game and was putting up numbers for the UJ team, though she played out of her guard position, she knew were to go and what to do, down at the post. Both teams showed a lot of heart on the court but the ladies TUKS was the team that came out victorious at the end, winning the 2008 USSA/SASSU champions. Next up was the battle of the Gladiators. 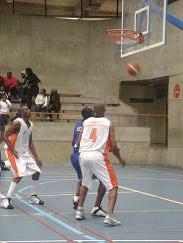 VUT vs. UJ (men’s). The game had the crowed on their feet from the get go and with VUTS’ big men Thabang Kgwedi and Toka Motaung being on foul trouble in the first quarter, you would thought that UJ would have used that to their advantage. There were awesome performances from the boys in orange like the likes of Lucky Loate who was very productive on the offensive side of the court, when he made a steal, got fouled on the 3 point line and still made the 3, making UJ lead for the first time at the end of the first half. Thabo Letsebe and Keogatile Amogelang (aka Angola) were on point on defence, just not enough to stop Nhlanhla Dlamini and Ayanda “Jordan” Shange. The score was tied at 62-62 with 2minutes and 10seconds remaining during the forth quarter. 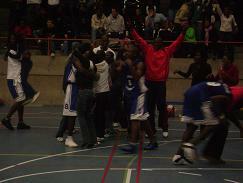 Miracles were pulled and the crowed were on their feet; with 19 second left and the score being 64-63 to VUT. The ball was in (Shooter) Nladi Mogumutsi’s hands at the 3 point line, when he missed 2 open shots that could have won the game for UJ. Unfortunately they too came up short. The defending champs Vaal University of Technology showed everyone that they can win without Neo Mothiba when they came up top wining the game 64-63. The level of competition at this tournament was immense, show casing the amount of talent the country has to offer in terms of basketball. Gauteng defiantly came up top as they scooped everything, from All Stars to MVPS’. This competition is the best thing that’s happened to University basketball in a very long time. Basketball South Africa should really consider having competitions were provinces can select district teams to participate in a National tournament. Just like it was done back in the days. Congratulations to The University of Cape Town for hosting such a wonderful event and congratulations to all the institutions that participated. We hope to see more from all the teams’ text year. i just read something interesting about mozambique basketball..how they run their league and have national championships..more like the previous engen u/18 clubs but with them what they do is that they run a league programme provincial for almost 8 months then the league winners play at the national tournament..
what caught my attention thou was that instead of the league being played on a 1st round and 2nd round, they have teams playing playing 3 games against each other on the league..then teams play more games..
if for example we have 8 teams, each team will end up playing 21 league games for a season not 14 games..am thinking shouldn’t we adopt the approach so that our teams play more games in a season..
We can bring as many teams as possible I am still not convinced this will automatically improve our bball. Coaches, coaches, coaches …….. this is the key to proper development in every sport. If coaches are not equipped our development will be slow and painful. i know that Joe but on the other hand, players improve a lot when they play many games.